Art Outreach Gallery invites Columbiana, Trumbull, Mahoning and Ashtabula career & technical education students to display your work at the Career Tech Education Exhibition at our Eastwood Mall space. A student awards reception will be held Saturday, April 29, 6:00pm at the Art Outreach Gallery. ENTRY FEE: A $1.00 entry fee per piece of art work per student. In collaborative pieces there is a $1.00 fee per student. A maximum of 5 pieces submitted per student. DROP-OFF: Works can be dropped off and hung Wednesday, April 26. All preparation of the space must be completed by Friday, April 28. Access to the gallery requires signing out of the key with Eastwood Mall Customer Service Center. You are also required to sign the key back in at the customer service center. The door lock is located at the bottom of the door. Please lock the door in place. There will be a Gallery volunteer at the Gallery to help hang the work and have the gallery open for your convenience. PICK-UP: All artworks will be picked up on Monday, May 15 and Tuesday, May 16 during mall hours. Teachers are responsible for supervising pick up and drop off artwork. Gallery volunteers will also be available for drop off and pick up of artwork. INVENTORY: The teacher will be responsible for the inventory. LABELING: The teachers will label all work. – We suggest that you use Avery label 5160 – 1”x 2.63”, clear mailing label with the students name, grade, school name, category and teacher’s name. You may add a price and contact phone number if the work is for sale. HANGING: Teachers and students are responsible for hanging and labeling all work. The Gallery will have volunteers and hanging supplies will be at the Gallery to help hang the work. 3-D PIECES: There is shelving, tables and platforms available for three-dimensional works. VOLUNTEERING: For the gallery to remain open it is essential that we have volunteers to gallery sit. Please encourage your students, Key Clubs, National Honor Societies, athletic teams, fellow teachers and parents to volunteer in the gallery; it is fun and an interesting way to share in this amazing community development program and unique art program. The gallery requires two volunteers at all times. The Gallery is open Friday 5:00 to 9:00, Saturday 1:00 to 9:00 and Sunday 1:00 to 5:00. There will be a Volunteer Schedule available when you drop off the artwork to sign up to Gallery sit. SALES OF WORKS: Frequently our patrons ask if the works are for sale. We invite your students to sell artwork, but do not handle the details of sale. In order to facilitate, we can provide contact information but will do nothing more. The Gallery will not provide direct contact information for any students without prior written consent and authorization. Also, the Gallery does not assume any liability for the sale of art and provides no warranty on sale – it is the responsibility of the parties. Teachers wishing to act as a facilitator for sales of their students’ works may provide their contact information or the contact information of the parent. CARE OF WORKS: You will need to help us take necessary precautions to safeguard your students’ works as well as the works of others at the Gallery. Understand that the Art Outreach Gallery and the Eastwood Mall cannot assume liability for loss or damage and that artwork will be handled and exhibited at the artists’ risk. Please help us make this a positive, enjoyable experience for everyone participating. RECEPTIONS/PERFORMANCES: You will have the opportunity to showcase your school district for one of the three weekends that you are participating in the show. The gallery will be available for your school’s art opening reception and recognition. Students from each school district will also have an opportunity to perform during their school exhibition and opening reception. 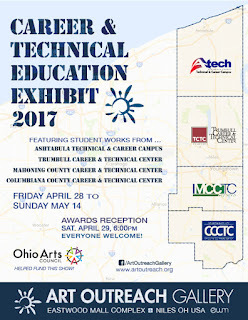 AWARDS: The student awards reception is scheduled for Saturday, April 29, 6:00 at the Art Outreach Gallery. Cash awards will be award for Best of Show, First, Second and Third Place. Show Plaques will be awarded to Best in Category. HANDOUTS: Each school district may provide a handout/flyer with the participating students and teacher’s names. PRESS RELEASES: The Art Outreach Gallery will send press release for the shows. Please RSVP confirmation of the number of students participating through Kate Antal at 330.518.6648 or kbernard@canfieldschools.net or Gail Stark at 330.219.7833 or aaboutique@aol.com. Artwork created using technology and computer software or works captured by a digital camera and heavily collaged or manipulated to produce digital multimedia work. Images captured by either an analog or digital camera and viewed as a print. May be black and white or color. Digital Photographs must be printed at minimum 300dpi at 5” x 7” or 8” x 10”. Special Instructions: Prints must be mounted on rigid board when submitting for exhibition. Oil, acrylic, watercolor, gouache, tempera etc. on canvas, canvas board, paper or any flat surface. Artwork made by the process of printing, usually on paper. Techniques include monotype, collographs, woodcut/linocut, intaglio, lithography, etching, silk screen printing, and other methods of printing. Pencil, ink, charcoal, pastel, crayon or scratchboard on a two-dimensional surface, usually paper. Special Instructions: Drawings copied from published photographs should not be submitted and may be disqualified. Drawings must be fixed with a suitable fixative and mounted on rigid board for submission and exhibition. An interactive media experience that makes use of game play and digital media (e.g., visual art, sound design, digital storytelling, etc.). Special Instructions: Video Game submissions must be playable games. Students may create games using the following recommended programs: Scratch, Flash, Game Salad and RPG Maker. Alternatively, students may submit work in another platform where the final game can be played by the judges on a browser on a PC without the purchase of any proprietary software or having to register for a private community. Submissions: You can upload one file (.exe, .zip, .rar, or .swf). You must also enter a 250-500 word gameplay summary in the provided text editor and a gameplay video of your game being played no longer than 5 minutes in length. Works must be submitted electronically via electronic submission guidelines. Collaboration: Video Game Design submissions can include up to 5 collaborators. A collaborative Video Game Design entry should only be registered ONCE for judging: choose one student to create an account and upload the work -- this student can then identify up to four collaborators on the Edit Info page. If the other collaborators are not listed when the work is submitted they will not be eligible to receive an Award. Works must be submitted electronically via electronic submission guidelines. Moving images viewed on a monitor, television, or projector. Animation can be hand drawn, computer-generated, stop animation or figure/model animation. Videos and films are shot with a film/video camera and are produced and edited. Projects may be of an experimental, abstract, or narrative nature. Register all students on the project. Works must be submitted electronically via electronic submission guidelines. Collage, assemblage, cut paper, handmade paper, batik, fine art books are accepted in the Mixed Media category. In general, artwork created with more than one medium should be submitted in the Mixed Media category. Combinations of painting and drawing applied only to one surface should be submitted to the Two -Dimensional category. Mixed media/assemblages meant to be viewed in the round should be submitted in the Three-Dimensional category. Three dimensional objects welded, modeled, carved, cast, constructed or assembled of any material including but not limited to clay, cardboard, metal, acrylic, wood, glass. The Art Outreach Gallery is an art appreciation initiative and community development project. 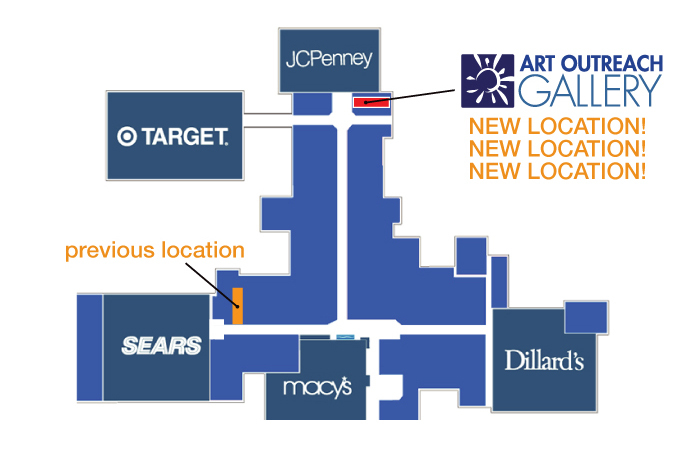 The gallery is next to GNC, along the JCPenny concourse. The hours of operation are Friday 5:00pm to 9:00pm, Saturday1:00pm to 9:00pm, and Sunday 1:00pm to 5:00pm. We maybe open throughout the week if we have volunteers to gallery sit. 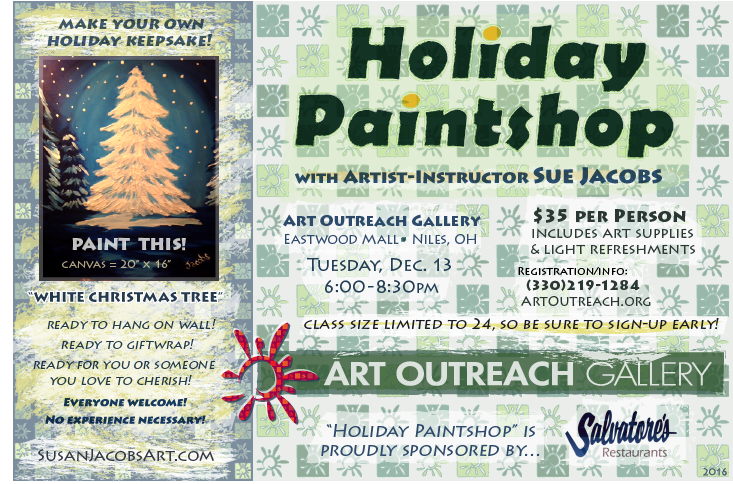 The Art Outreach Gallery invites you to Holiday Paintshop, a holiday-themed painting class at our Eastwood Mall space on Tuesday, December 13. Award-winning artist and local art teacher Susan Jacobs is the instructor of this fun-filled event. Please be sure to tell your painter (and newbie!) friends--it's always more fun to paint together! 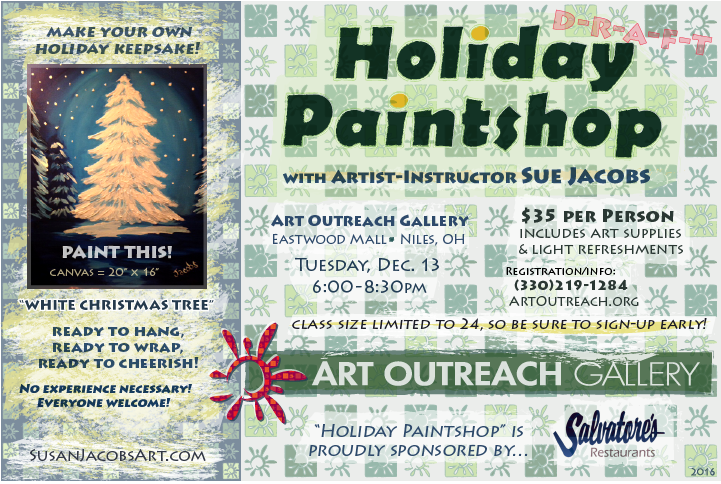 The Holiday Paintshop class is strictly limited to 24 attendees--so be sure to sign up soon. The $35 workshop fee includes all paint supplies and helps support Art Outreach Gallery exhibits, workshops and events. Beverages and light refreshments are provided by event sponsor Salvatore's Restaurants. Did we mention hand-painted artworks make WONDERFUL GIFTS?! The Art Outreach Gallery is pleased to exhibit "Beautiful Minds," a collection of portraits by student photographer Gabby Scianna. 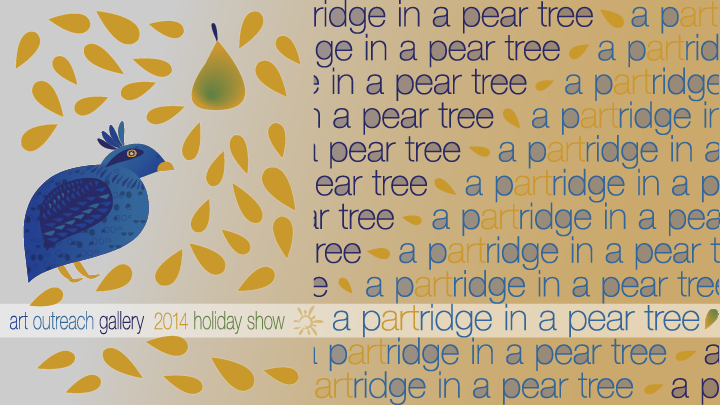 The show opens Friday, Nov. 11 and runs through Sunday, Nov. 27. An artist reception will be held at the Gallery from 6 to 8 pm, Friday, 11/11. In Scianna's own words: "Behind a beautiful subject lies a beautiful mind, personality, and spirit much deeper and stronger that the struggles they have overcome. 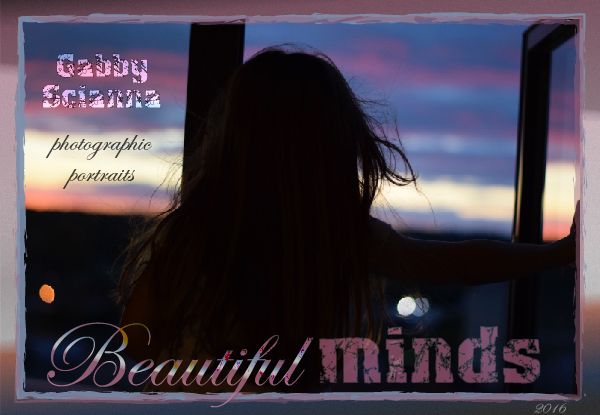 'Beautiful Minds' is a collection of my portraiture, continuing with the theme of 'Overcome.'" Upon graduation, the Canfield High School senior plans to further her photography study at the Ringling College of Art & Design in Sarasota, Florida. The Art outreach Gallery is pleased to present a new photography exhibit by Canfield High School student-artist Gabby Scianna. 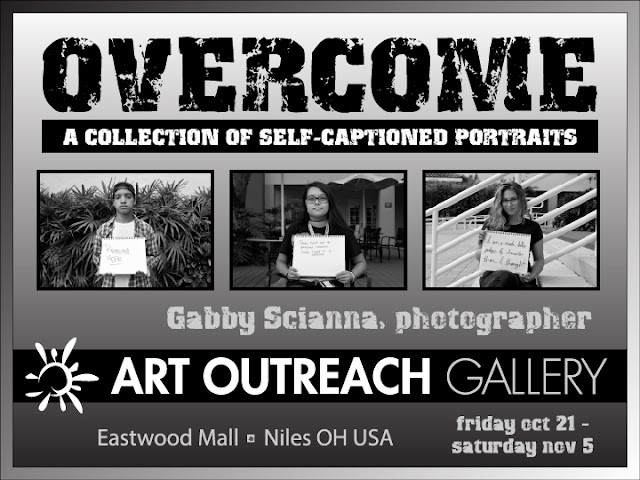 "OVERCOME" is a collection of ten black & white photographs of fellow students holding self-labeled signs. 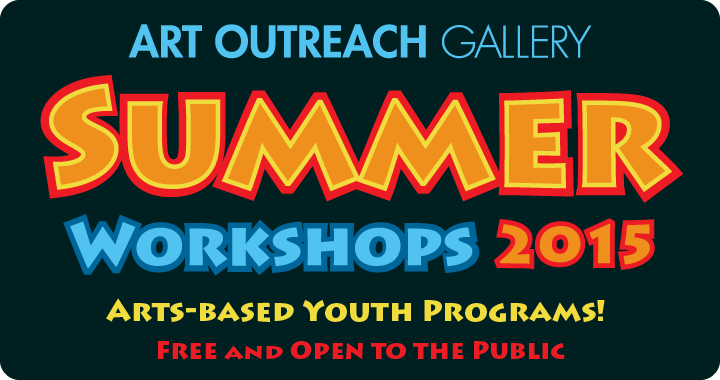 The Art Outreach Gallery is pleased announce 26 new YOUTH WORKSHOPS for 2016! The FREE arts-based classes will be held at our Eastwood Mall space and run from Tuesday, June 21 to Friday, July 15. Printed programs listing workshop schedule, descriptions and registration information can be picked up at the Art Outreach Gallery and the mall information booth. Click HERE to view and/or download workshop schedule, description, contact and instructor information. Here's a link to a downloadable REGISTRATION FORM. Class space is limited, so sign up soon! See ya' at the SUMMER WORKSHOPS! The Art Outreach Gallery is absolutely elated to host A Day in the Life, the Community Artworks 2015 Regional Artist's Exhibition! The show features 75 works by 41 local artists, and runs from Sunday, October 4 to Sunday, November 8.